How to grow your Blackberry Cane with pictures and advice. 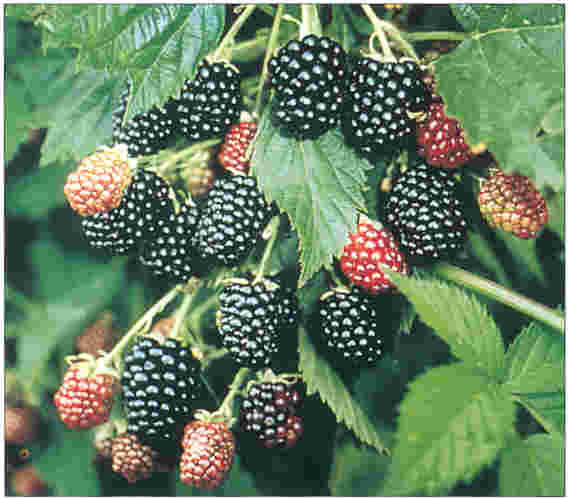 The easiest of the berry fruits to grow in cool and temperate areas. Very tolerant, but full sun and medium well-drained soil best. Blackberries are extremely tolerant of site and soil conditions. They are especially unusual in that they will produce a reasonable crop of berries even when grown in deep shade. Delicious both cooked or eaten fresh, they are bursting with flavour and excellent for your health. Blackberry canes are not widely grown, because previously they were readily available growing wild amongst hedgerows. But these hedgerows are disappearing fast and it now makes sense to grow them in your garden or allotment. Blackberries will grow reasonably well in almost all soils and even in deep shade. Remember though, that blackberry plants may well last for 15 years or so, so do try and start them off in the best possible conditions available. Loch Ness - click to enlarge) As far as soil is concerned, they will produce of their absolute best on a medium, well-drained soil which contains plenty of organic matter. They like the soil to hold a good supply of water, especially when the fruits are developing in summer. The worst soil for a blackberry is light chalky soil - lots of well rotted compost will help to improve these conditions. Thorny varieties of blackberry are the strongest growing, so choose these if the soil conditions are not ideal - 'Himalaya Giant' is the best variety to grow where the site or soil conditions are not ideal. Good fruits will still be produced and the poor conditions will reduce the excessive vigour of this variety. Positioning of blackberry canes is a personal matter dependant on your garden. The best berries will be produced when they are in full sun. However, where space is at a premium, a blackberry cane will produce good crops even when grown in deep shade - none of the other common fruits will survive in these conditions. Blackberries produce their flowers very late in the season so frost will never be a problem. Low lying land or frost pockets are quite suitable for blackberries. Message: Just starting out growing blackberries. can you explain to me how to tell the primocanes on the plant when there are no berries. I just planted blackberries this year and have nice healthy looking plants but no berries. Am not sure how to protect them in winter. Have both the thorns and thornless plants. Message: we have one year old canes not sure how to cut where and to allow what to grow where to produce the best fruit. Message: I live in Denton, Texas, 76208, and as you may know, it has been extremely hot here. I have been forced to water every day but still having problems. Thought of shading the plants during hotest hours but worry about 6-8 hours of sun needed. I was wondering of you could tell me where black berry's grow and where they are originaly from. Message: Do you know how to grow blueberries? Message: looks like i'm going to have a ton of blackberries. i planted my raspberries next to them, and i think by next year i'll have hybrids that will knock my socks off!! very easy to grow, but pruning won't be fun, i can tell already. Message: Hi plants are 2 years no berries . What one do I cut back?